Lord Pushpadanta (or Suvidhinath) in his earlier incarnation was King Mahapadma of Pushkalvati Vijay. He had done hard and deep spiritual practices and purified his soul to a high extends in his life. Because of this he reincarnated as a God in the Vijayant dimension. From the Vijayant dimension of gods this soul of King Mahapadma descended into the womb of queen Rama Devi, wife of king Sugriv of Kakandi. One morning when King Sugreev was going for ‘Guruvandana’, he called upon Queen Rama Devi. When Queen came at the door, she was looking little tired. When King asked her, she said that she was a bit tired but very happy from inside. She added that she had seen some very auspicious dreams early in the morning. It was like a chain of fourteen (sixteen according to the Digambar Jain Sect) great things. Both of them went to muni Shri Shantipriya, and asked about the meaning of the dream. Hearing this muni ji said that now King and Queen both should be happy and spend more time in devotion of lord, as they will soon have a son who will become a Tirthankara. On the fifth day of the Margshirsha Krishna month of the Hindu calendar, queen Rama Devi gave birth to a son. During the period of pregnancy queen Rama developed a strange capacity to perform things in the correct process and to develop processes for doing even the most difficult tasks. Everyone got astonished at her skill. On the birth of the child their Guru (kulguru) shri Yashobhadra came there to see the child. Looking at him he said, “King! Your son has all the qualities of becoming a great man. I think queen because of her prayers which she offered with ‘suvidhi (correct process)’ has got him. So according to me his name should be, Suvidhinath". During the teething period of the child the mother got a craving for playing with flowers. As such, he was also popularly known as Pushpadanta (flower-tooth). As pushpadanta grew up he was married to many pricesses. He used to spend most of his time in meditation and other devotional works. One day King Sugriv thought of following the path of renunciation. 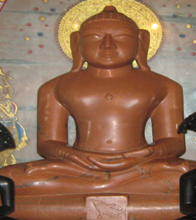 He appointed Pushpadanta as king and left for jungles to practise asceticism. King Pushpadanta performed all his duties of worldly life but still remained detached. One day Suvidhinath was thinking about his worldly life. He was upset as to for how long will he keep on moving in the cycle of birth and rebirth. Then suddenly he saw everything about his past life in front of him as a moving picture. This made him realize the goal of his life. He decided to leave everything and move towards his goal i.e. complete salvation / moksha. On the 6th of Mangsar Krishna Paksh (according to Hindu Calendar), he removed all the worldly belongings from his body, pulled out his hair with the fist, said, "Namo Siddhanam" and disappeared in the crowd. He became an ascetic and indulged in rigorous penance and lofty spiritual practices. After becoming a saint, Suvidhinath went roaming from place to place spreading the message of peace and religion. He faced many attacks from the wild animals, many times women tried to attract him towards them but in vain, many natural difficulties came in his path, but he faced all with courage, patience, tolerance and deep meditation. After four months of rigorous spiritual practices he attained omniscience under a Maloor tree. Suvidhinath ji was now ‘Arihant Suvidhinath Bahgwan’. In his first Samavsharan, Mahapandit Varah of that time also came and asked many questions to Arihant Prabhu. Suvidhinath ji answered all the questions and Varah submitted himself in the feet’s of the lord and took diksha. His last pravachan was on a hill of sammed shikharji from where on the ninth day of the dark half of the month of Kartik (according to Hindu Calendar) he shed away all the remaining karmas and attained Nirvana. The tradition of the four pronged religious ford started by Bhagavan Rishabhdev gradually became extinct after the Nirvana of Lord Pushpadanta. After his liberation, first the ascetic organization disintegrated and then a time came when there was no ascetics left. The religious discourses too were given by common citizens or Shravaks. Slowly the influence of wealth became overpowering and people started forgetting the principles of five vows including Ahimsa and truthfulness. The discipline of spiritual principles gave way to ritualistic exchanges of wealth and total indiscipline.